Summer and baseball are getting closer, and the Rumble Ponies are excited for all the FUNN planned for the 2019 season! From Opening Night, to bobbleheads and amazing promotions, take a look at what's in store for an amazing summer! All details including appearances and giveaways will be announced throughout the winter and early spring. Check in to the Rumble Ponies Facebook and Twitter pages (@rumbleponiesbb) for more information on the 2019 Promotional Schedule. Oh, brother! The Rumble Ponies host Peanuts Night with a specialty jersey honoring the big man himself, Charlie Brown, on Saturday, April 27th. The team will sport the iconic yellow tee for a specialty jersey, which will be auctioned off via LiveSource. Find the app in your providers app store to download! On Saturday, May 11th 1,000 lucky fans at the game will go home with a Jacob DeGrom bobblehead, sponsored by Fullington Travel! It was only six years ago DeGrom rocked it in Binghamton. Now the recipient of the 2018 Cy Young award, celebrate his accomplishments at NYSEG Stadium! They grow up so fast! It's time to Sock Out Cancer on Sunday, June 2nd. Partnered with Security Mutual Life Insurance on National Cancer Survivors Day, fans can bundle a ticket to the game and socks to rock during the afternoon. The Rumble Ponies will be sporting the socks in honor of those families fighting cancer. Part of the proceeds will go back to Sock Out Cancer and STAY LOCAL, benefiting families fighting in the Southern Tier! Join the family at NYSEG Stadium for Italian Heritage Night on Saturday, June 15th. Classic Italian food and entertainment, as well as a special appearance by Johnny "Sacks" Sarimoni himself, Vincent Curatola, from The Sopranos. Non vedo l'ora! U S A! U S A! Cheer on the USA Women's Soccer team during this Women's World Cup at NYSEG Stadium! Come out and meet former Team USA Women's player Kristine Lilly! Lilly played every minute of the six games of the 1999 Women's World Cup, scoring one of the crucial penalty kicks to secure the win over China. Don't forget those Olympic gold medals too! Binghamton may be an hour from Scranton but there's no reason not to celebrate "the people person's paper people". The Office Night comes to NYSEG Stadium with Brian Baumgartner, who plays fan favorite Kevin Malone, in attendance on Saturday, July 6th. To say we miss Tim Tebow, would be an understatement. 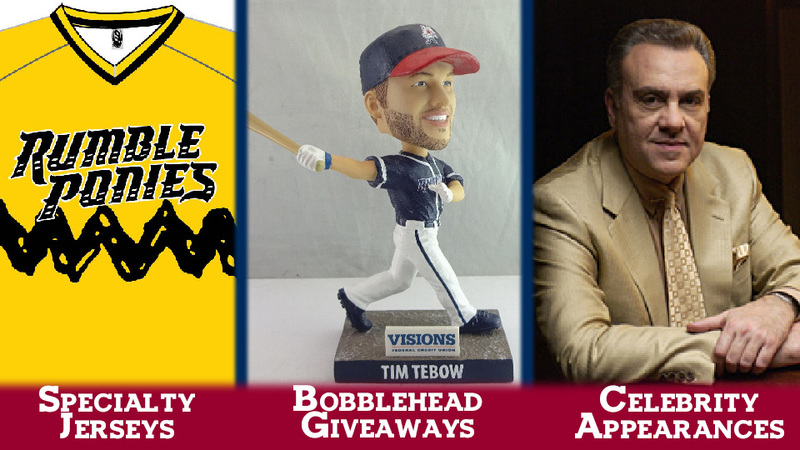 We miss him so much that we're having a Tim Tebow Bobblehead giveaway, sponsored by Visions Federal Credit Union, on Tuesday, July 16th. The first 1,000 fans at NYSEG stadium will receive one; one per person while supplies last. Posed to honor his homerun streak during his first games *knock on wood*. Mutt Monday: Dogs are welcome in the ballpark every Monday home game for free! Dogs must be leashed, with up-to-date shots. Enjoy $1 hotdogs sponsored by Sabrett! Take Me Back Tuesday: Hold on to those seats as we take it back in time! Dust off those wind breakers and togas, every Tuesday home game will be themed to different eras in time. We Care Wednesday presented by M&T Bank: Come out & support local non-profit organizations; BOAC (May1), United Way (June 12), Corner Stone Family Health (June 26), Southern Tier MobilePack (July 31), American Cancer Society (August 8), A Room to Heal (August 14), & Children & Youth Service Counsel (August 28). Thirsty Thursday: Drink specials until Last Call! Sponsored by 98.1 The Hawk & Labatt Blue. Firework Fridays: 11 shows for the 2019 season, sponsored by Toyota! Catch a classic show or see our themed entertainment. Family FUNNdays: Perfect for all young at heart! All Lil' Galloper's can enjoy family themed promotions including Circus Day, Touch-a-Truck, Faith & Family, and Art in the Park! Sign up for the Lil' Galloper's HERE! It's FREE for kids 12 & younger. Don't miss any of these other great promotions coming to NYSEG Stadium!